I don't think that Natasha will mind me posting about her progress in the hospital here... after all she did give me her blog login information forever ago! She got a call for lungs on Wednesday morning for attempt #5 at new lungs. Up to this point all the other calls resulted in lungs that couldn't be used, but this time they were good. She went into surgery for 6-7 hours and when she came out they slowly eased her off breathing assistance until Friday when she was breathing 100% on her own. She's doing Really well and is not in much pain thanks to lots of drugs. She can sit up in bed and talk to people, but she's not able to be up and about just yet. 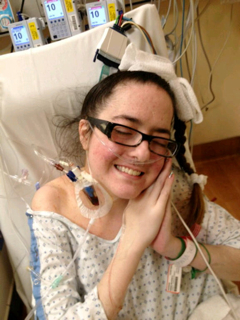 This weekend she may be moving from the ICU into a regular recovery room, but that's yet to be determined. Superbowl Sunday we had another false alarm. I really thought this time was it! All the stars seemed aligned. It was really dissapointing for everyone to be sent home yet again. It's really hard to see people so let down. Home a little battered and bruised.